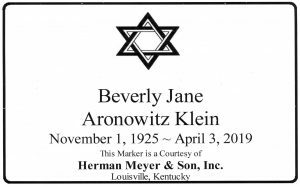 Beverly A. Klein, 93 – Herman Meyer and Son, Inc.
Beverly A. Klein, 93, died Wednesday, April 3, 2019 in Louisville, KY. She was a native of New Orleans, LA, born November 1, 1925 to Jacob and Hannah Aronowitz. She is survived by her loving husband of 70 years, Elias Klein; her daughter, Meryl Klein (Barbara Loevy); her sons, Jon Klein (Laura) and Jerrold Klein; and two grandchildren, Rachel Chaimovitz (David) and Sarah Klein. Beverly’s family would like to extend a special thank you to all the caregivers with Carmelita’s Quality Care for the loving care they provided. Graveside services will be 1:30 p.m. Friday, April 5th at Adath Jeshurun Cemetery, 2926 Preston Highway. Expressions of sympathy may be made to Congregation Adath Jeshurun, 2401 Woodbourne Avenue, Louisville, KY 40205 or Dare To Care, 5803 Fern Valley Road, Louisville, KY 40228.